As we noted in a post last week, a new accounting standard for operating leases comes into effect at the end of this year, where leasing costs must be reported on the balance sheet as liabilities. Today we want to explore the opposite end of that exercise: what about all the leased goods that companies will add to the balance sheet as assets? After all, the goal of new standard (ASC 842) is to help investors understand both the costs and benefits of all those operating leases. So while we all tend to talk about leasing costs on the liabilities side, we can’t forget that a corresponding adjustment will also take place on the asset side, too. For example, a company’s return on assets is likely to change because the company will be adding assets. ROA is a performance metric analysts use to assess how well a company can turn a dollar of investment into profit. You calculate ROA by dividing net income into total assets, and express the result as a percentage. The higher the percentage, the better a company’s ROA. But if you add leased assets to the balance sheet, the denominator of that equation gets bigger, which means the ROA percentage will get smaller — because of a change in accounting rather than a change in underlying business operations. Consider this hypothetical example below, where we increase assets by 40 percent (a very reasonable estimate of what companies might report). Hmmm. First, we visited our Multi-Company Page and pulled up what the S&P 500 reported in 2017 for net income and total assets. That would let us calculate “normal” ROA. We also pulled up each filer’s future lease payments (which you can do with the normalized metrics Calcbench tracks), and added that number to total assets, under the theory that the costs on the liabilities side must equal the value on the asset side. We’re not sure that technique is entirely street legal in the world of financial analysis, but it’s a good approximation to assess our general point: that filers’ ROA could change in spring of 2019 when the new standard starts showing up in corporate 10-Ks, and possibly to a material extent. Collectively, the S&P 500 had $1.05 trillion in net income last year and $34.4 trillion in assets. That’s a return on assets of 3.04 percent. The S&P 500 also had $631.32 billion in future lease payments as liabilities. If you add that amount to total assets, then adjusted ROA falls to 2.99 percent. Is that a lot? We’re not sure, although any time a metric crosses some significant threshold — like crossing from one whole number to the next — we could imagine automated trading programs going nuts, without necessarily understanding what’s really happening. 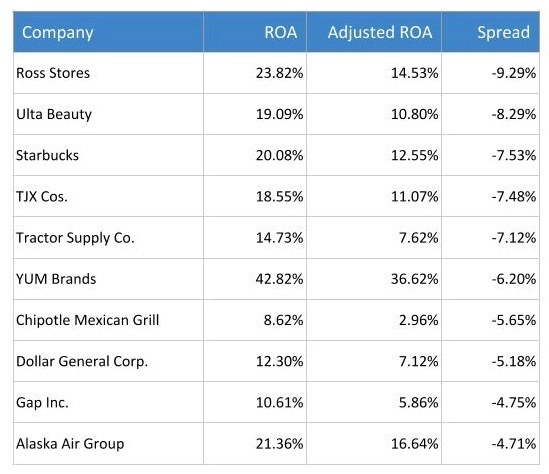 We also measured the spread for each company between its true ROA and the adjusted ROA it would have reported if the leasing standard had been in effect, and ranked them from largest spread to smallest. Here are our top 10. We noticed one other mathematical quirk. If a company reports a net loss, by definition its ROA will be negative, because division or multiplication including a negative number always results in a negative answer. OK, but that also means adding to the asset portion of the formula increases ROA. Take a look. Financial analysts may question the wisdom of that result. If a company is already losing money, and now we’ve added even more assets that it needs to invest into income, is the situation improving or not? It’s an interesting question, and one you may want to pose to a CFO on that next earnings call once the new leasing standard goes into effect.